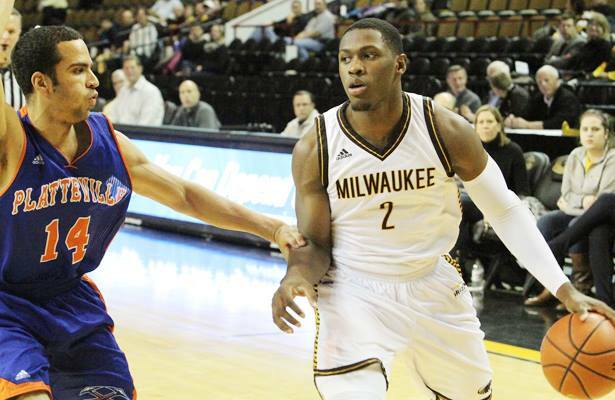 Despite only leading by two points at the end of the first half, the Milwaukee Panthers came out strong in the final 20 minutes of play, beating Platteville 68-54 in an exhibition contest at the UW-Milwaukee Panther Arena on Thursday evening. With Austin Arians sitting out after rolling his ankle a couple weeks ago, the Panthers needed someone to step up and fill the void left offensively. Akeem Springs was that guy. Springs, a sophomore transfer from Northern Illinois, displayed his excellent ability to drive to the hoop, tallying a game-high 15 points, with nine of them coming in the opening eight minutes of the second half. Springs is a big, physical guard who plays well on both sides of the ball. Sure, he needs to become a more consistent shooter, but he has the skills and potential to be an outstanding player for Milwaukee. Besides Springs, senior point guard Steve McWhorter also chipped in 14 points, while junior forward Matt Tiby added 10 points and 13 rebounds for Milwaukee. With this only being an exhibition contest, it allowed Jeter to player more of his younger players to see how they would perform in a game situation. Although sophomore guard Cody Wichmann was only able to score three points in 21 minutes of action, he played well, especially for at times having to play forward, when Jeter decided to use a smaller lineup. This versatility for Wichmann, to go along with his solid ability, will help him earn more minutes throughout the regular season if he decides to not redshirt this season. Redshirt freshmen Alex Prahl and Brett Prahl were also able to finally step onto the court in a Panther uniform for the first time after sitting out all last season. In their limited time on the floor, they brought a physical attitude, displaying their excellent potential. These two players are both physical forwards, who will provide Jeter with a lot of size off the bench this season. Another freshman who fans were eager to see in this contest was guard Justin Jordan. In his six minutes of playing time, he showed glimpses of his ability to handle a team, playing well for an incoming point guard in his first game. While some might have been disappointed that this was a close game early on, this could have been a positive thing for the Panthers. It allowed them to feel the pressure of playing in a close game, and it will allow them to take a lot more away than a blowout victory would have done. Milwaukee will open their season next Friday night on the road against the Auburn Tigers, but there still is some work that needs to be done in order for them to be ready to face a high-major program. Jeter and his staff will figure it out, and when they do expect the Panthers to make some noise because they have a lot of talent, especially at the guard position.